The glorious return of the goat-fish-people! 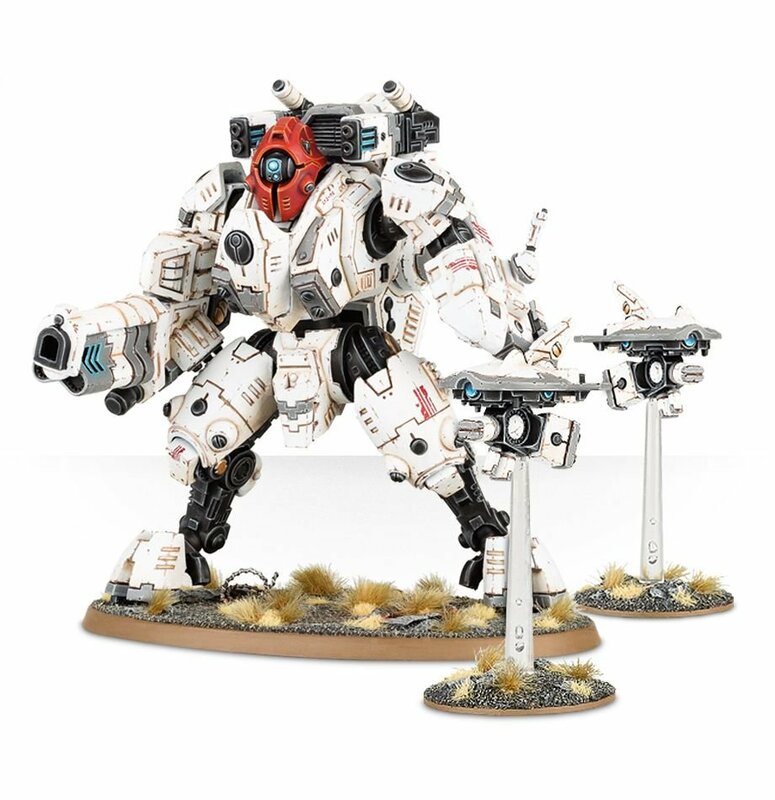 That’s right, I’m back to playing with my burgeoning Tau force, after what feels like an eternity where I couldn’t decide where to apply my hobby focus. Truth be told, I’d almost left the hobby on the shelf these last few weeks, and have turned instead to sorting out my garden. 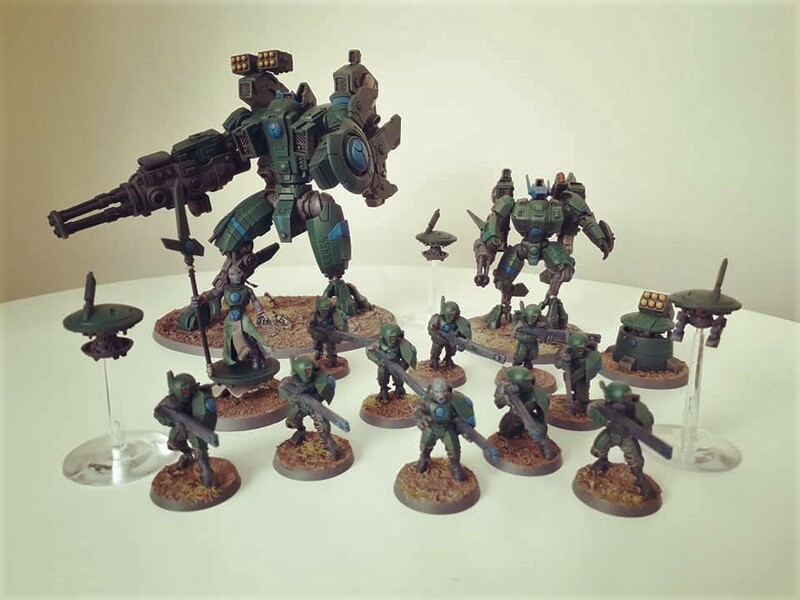 Well, that’s now almost finished, but I’ve been keeping myself ticking over through one thing and another, then managed to get a couple of games in last Friday, and so I thought I’d ramble for a bit here once again about my Tau thoughts! Having had my first game with the army almost a month ago, I’ve waxed and waned a little over them, until having an invitation to a game against another guy at my local GW, Kev, whose Deathwatch I’ve come afoul of before with my Necrons! With their new Codex out, though, I really fancied a Codex vs Codex battle, to see how things pan out. Spoiler alert: pan out, they did not! My list was mainly infantry this time around, with three units of 10 Fire Warriors, a Fireblade and the Coldstar Commander, along with the Broadside and a Crisis team. We were playing to 1000 points still, and I failed to get the first turn, which basically obliterated most of my army. Kev uses a Corvus Blackstar to stunning effect, and I think my Fire Warriors were just blown off the table before I could blink! He also likes to have a Dreadnought supporting his Watch Master, who affects the entire table for re-rolls in an almost perverse manner. Seriously, it was quite stunning to watch, but really stressful to play! As the game was over so quickly, we had a smaller, 500-point game, which really played to my strengths as I have so many cheaper units as opposed to the Deathwatch, but while I had reduced his entire army to just the Watch Master, he still managed to kill off everything despite being inches from death. I definitely need to stay away from close combat as Tau! 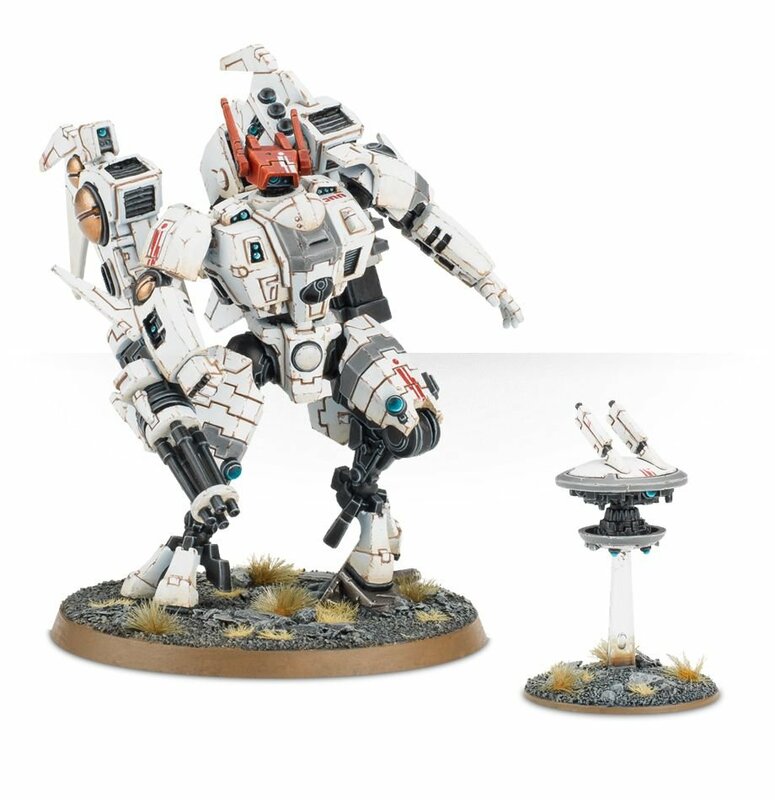 So what did I learn from my second (and third) games with Tau? To begin with, I really need to have that first turn to survive! It’s nothing that can be guaranteed, clearly, but in my third game, I had first turn and obliterated a unit of Veterans between the Fire Warriors and Commander, as well as taking off a decent chunk of Dreadnought. The fire power is definitely there, so it’s something I’d like to really try to capitalize upon, and so I need to either have first turn, or survive to my own turn to retaliate. I also need to hang much further back. I play Bork’an Sept, which makes my Fire Warriors with pulse rifles rapid fire from 18 inches, but I still deployed much closer to the centre than I should have! I had two units of Strike Team with a Fireblade between the two, and he never got to help them one bit! (I also learnt that Fireblades grant an extra shot to models within 6″, not units). Gun Drones cost 12 points, whereas Marker Drones cost 10 points. However, Marker Drones only fire a single light, and if you miss with it, those 10 points were wasted. 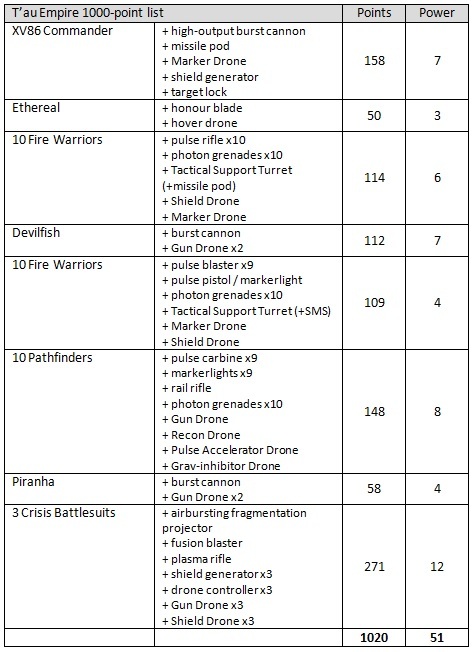 In the absence of a battlesuit equipped with Drone Controller, those Drones are hitting on a 5+, whereas for 8 points a piece, you can get a Pathfinder who will hit on a 4+. No brainer, especially since Pathfinders are the only ones who can take Pulse Accelerator Drones, granting those Fire Warriors a rapid fire range of 21″! Pathfinders are definitely something I should be including more often, especially when they come so cheaply and bring along helpful PAC drones! I took three Gun Drones and 8 Marker Drones, and I think I need to alter that ration much heavily for the former. I also think Shield Drones are the better option if Pathfinders are in the team. Dashing round to intercept wounds is a much better deal, overall! I think it’s safe to say that I’ve learnt that Marker Drones are doing me no favours, and I need to concentrate on more Shield Drones, with a fair few Gun Drones where I can fit them. I also need to remember my Stratagems! I can’t remember how many times my Commander has been charged, and for just 1CP I could be using Repulsor Impact Fields to potentially make them think twice about it, if they’re potentially suffering Mortal Wounds. Neuroweb System Jammer is also a good one – especially with the amount of silly buffs Deathwatch get. Putting them back to normal ballistic skill could be very useful! I’ve noticed that, in general, I tend to be quite conservative with my Command Points, and I think I evaluate the 2CP Stratagems much more seriously than the 1CP-cost ones. Speaking of under-valuing things, I frequently get so confused by Grenades that I rarely use them. Certainly, I don’t think I’ve ever tossed a grenade with my Drukhari! Photon Grenades could work amazingly in Overwatch, again potentially dissuading someone from charging if they might have to subtract 1 from their own hits until the end of the phase. Photon grenades bring me on to where I want to go next with the force, anyway. 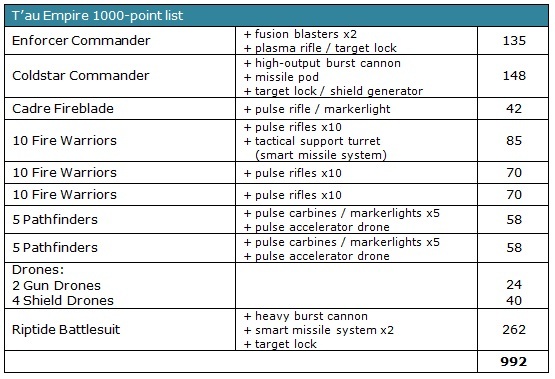 I talked a little about a gun-line in my last Tau blog, but I’ve now drawn up a different 1500-point list that I want to work towards. To allow for greater flexibility, I’ve decided to create a Core Army that can then be added to as I like. This core army consists of 1340 points, arranged across two Battalions and an Outrider detachment. In the first Battalion, I have the Coldstar Commander and a Cadre Fireblade, along with two units of 10 Fire Warrior Strike Team (each of which has a support turret with smart missile systems) and a 10-man Breacher Team. The second Battalion has the same three troops choices replicated entirely, along with an Enforcer Commander and another Cadre Fireblade. The Breachers bring me on to a tangent here, as I was giving them both a turret and a Devilfish transport. It just makes no sense, as I want the Breachers to get a little closer than the Strike Team, given that their pulse blasters work better at closer ranges. However, they are Assault weapons, so there’s no need to give them a transport as I don’t particularly feel like I want them to move too far away from the main line. Instead, I see them as more of a harassment unit, taking objectives where required (more on this later) and also helping to protect the gun-line with For the Greater Good when required. 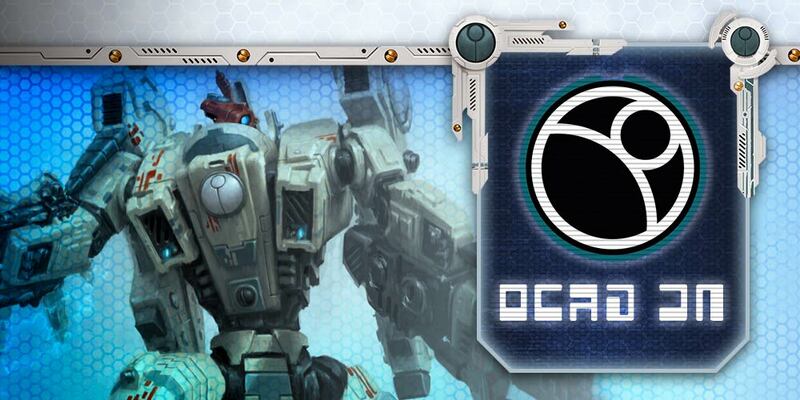 The Outrider is three full squads of Pathfinders, along with two Ethereals. If I have been undervaluing photon grenades, then I have done the Ethereals a massive disservice! Granting re-rolls of 1s in the shooting phase is massive, especially since I have no plans to move my Strike Teams anywhere! 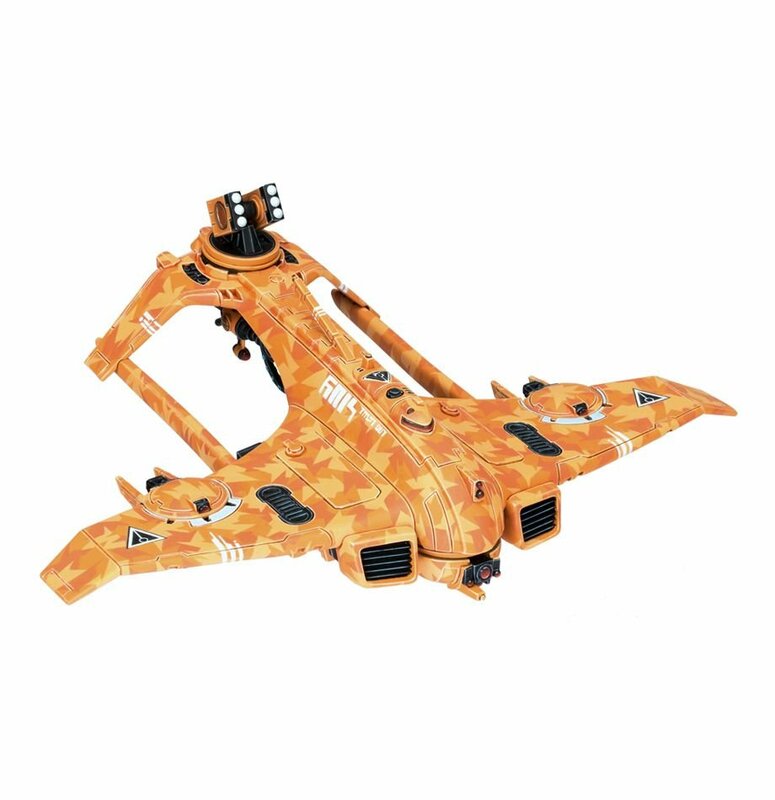 Looking ahead, I want to get myself a Sun Shark Bomber. While I’m sad they’re currently out of stock everywhere, I would like to finally try some air support for the army, having never tried flyers in a game up to now. While I know it’s not like the Corvus, I would like to see how much damage I can wreak from the skies with this bad boy in the air. It’s also a different type of unit for me to use, and I like that. While I’ve never really gotten into using either a Dark Scythe or Voidraven for my Necrons or Drukhari, I think I’m actually excited to be using flyers here in the Tau! 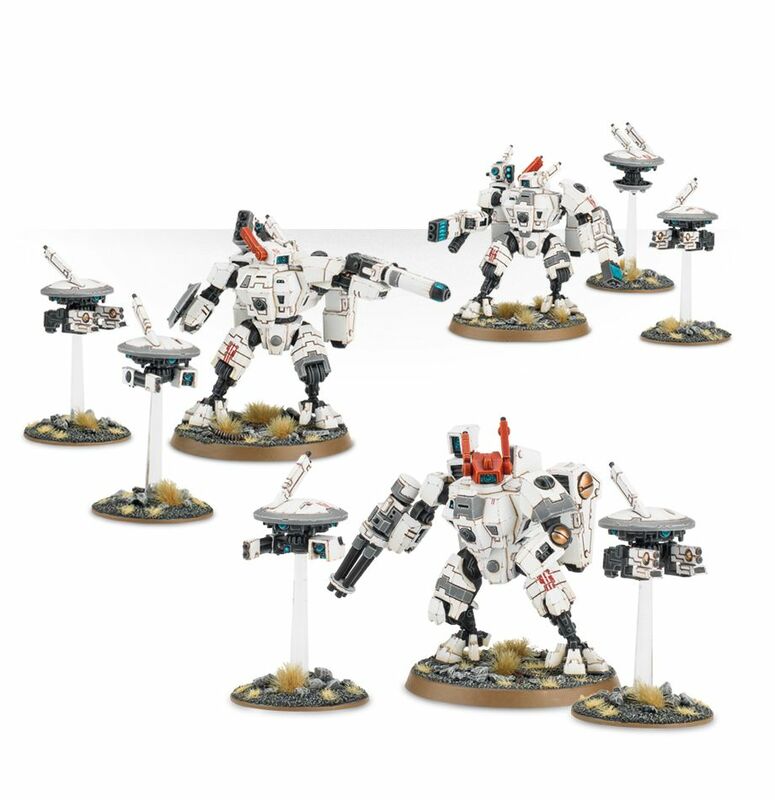 I’m currently envisaging a deployment where I have my four squads of ten Fire Warriors, possibly in two ranks of five, with an Ethereal between squads one and two, and another between squads three and four. Ethereals buff units within 6″, so that should work fine. Fireblades buff models within 6″ of him, though, according to the way I read it, though I’ve since been told it is the unit, so I think a similar situation will occur with those. I’m still a bit caught between using the Fireblades as Markerlight hits on 2+ or firing three pulse rifle shots of their own in rapid fire range, so I guess we’ll have to see how I’m feeling when the situation arises! I’m adding in some Shield Drones to protect the Commanders and Ethereals as well, which I’m thinking to position roughly between the Fire Warriors and the HQs. 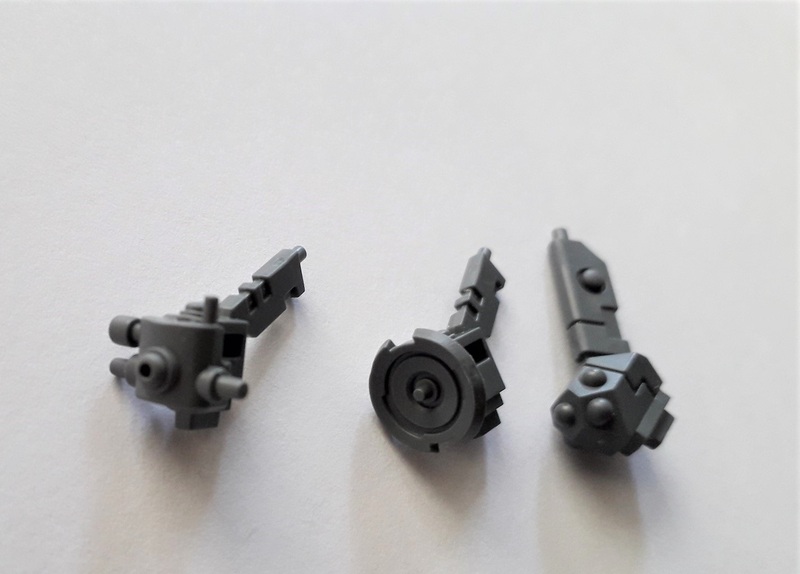 I’m giving the Fireblades two Gun Drones a piece, so that they can do their thing there. 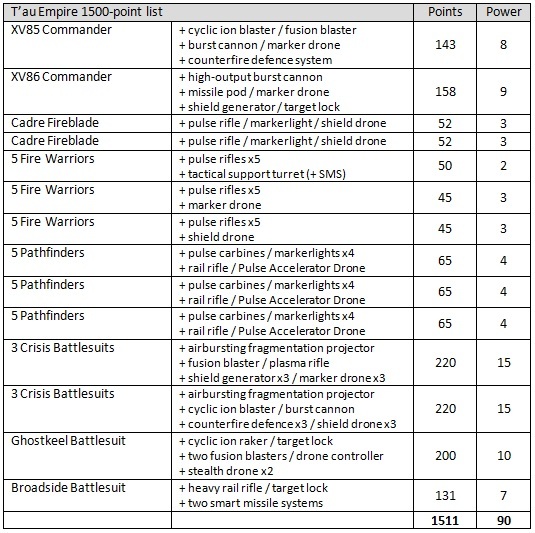 To bring it up to 1500 points, while the Sun Shark Bomber remains out of stock, I’m planning to include the Broadside and some more tactical drones for the time being, though I think I’ll eventually want a Hammerhead for the heavier support – when playing those games last week, the 6-wound Broadside was quite easily destroyed in a single turn of shooting – great as a distraction, for sure, but I would like a sturdier chassis for the big guns. So that’s my rambling about the gameplay done, what about the painting? While I do still need to get the Sept markings on him, by and large I’ve finished the Commander! I’m actually really pleased with how he’s turned out – the highlighting on the green hasn’t really come across that well in the photographs, but it looks nice and subtle. It’s taken me far too long to get this guy finished, mainly due to not having a clear idea for the paint scheme, but I think now that I’m more aware of where I’m going with it all, I should be able to get moving with some of the other units I have on the go right now. 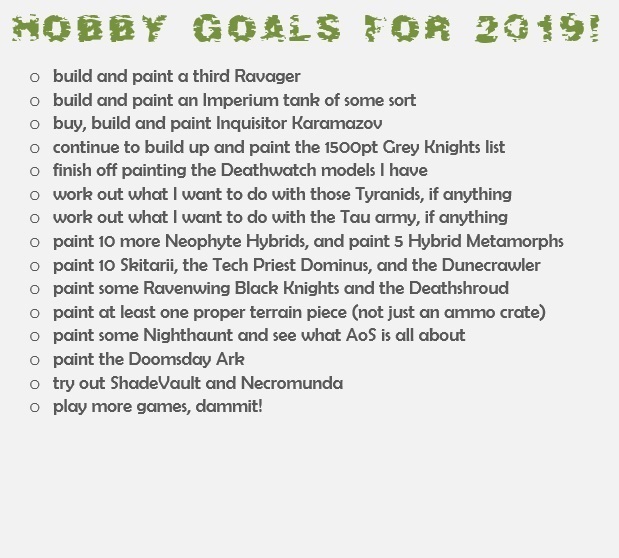 I did say that I was thinking about doing a sort of Tale of (One) Warlords thing here on the blog, and that I wanted to get the Start Collecting box finished by the end of April, but clearly that hasn’t happened! 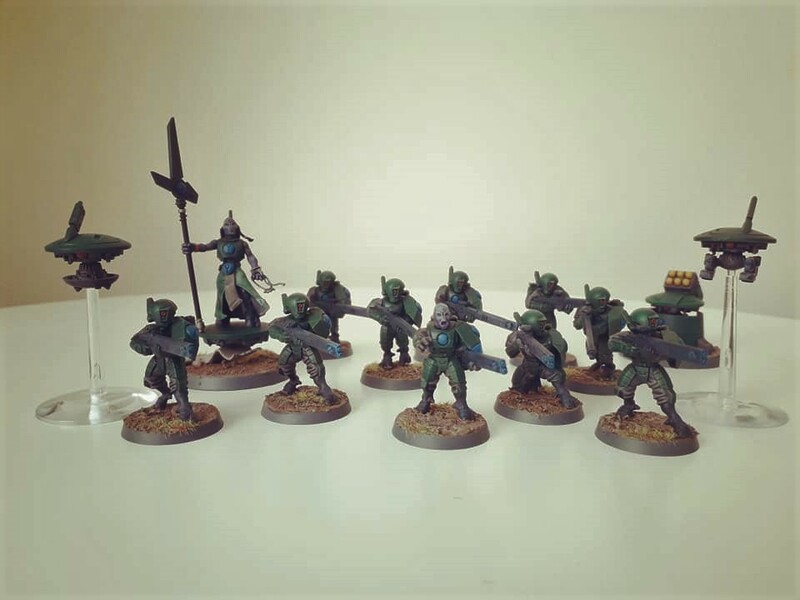 However, I want to next move on to finishing the first Fire Warrior team, alongside the Ethereal, before then moving on to Pathfinders and a Fireblade. I think if I can do that, having a squad and a character, it should help to keep me occupied by enough variety that I should be able to get through them all quickly enough! 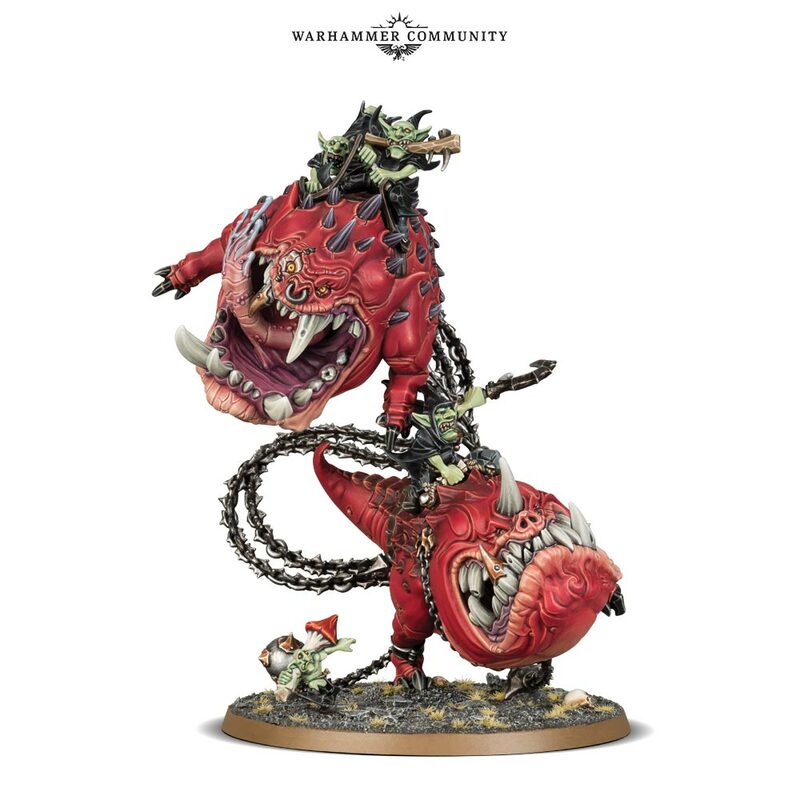 Author spalanzPosted on May 21, 2018 June 29, 2018 Categories WarhammerTags new army, Tau, Tau Empire, Warhammer 40k5 Comments on The glorious return of the goat-fish-people!